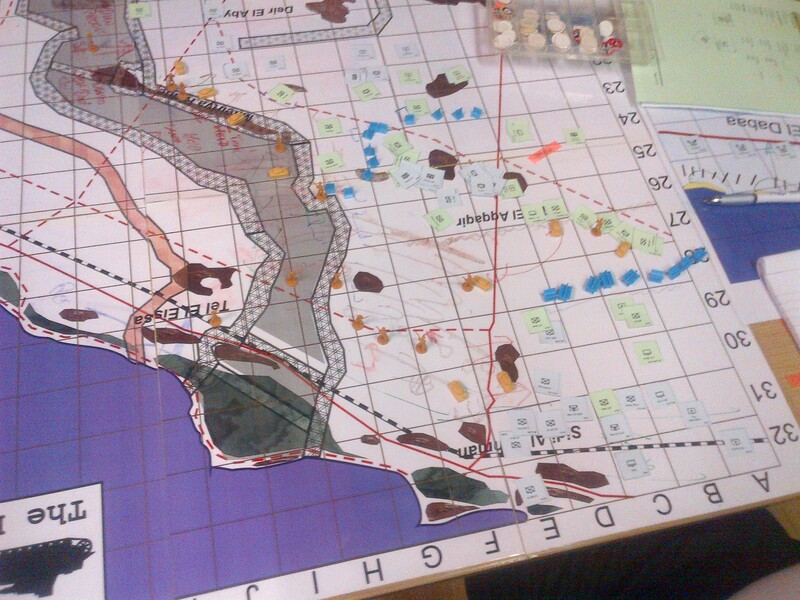 ‘The End of the Beginning’ – El Alamien Megagame. A few weeks ago the usual gang (Brian, Chris, Evan and myself) went along to the Royal Armouries in Leeds for another Megagame session. Brian, Evan and I were grouped together as one team of Germans; the forces under our control were located in the middle (Kampfgruppe Mitte), that said we were playing a condensed version of the battle. Due to a smaller number of players present in Leeds from when it was first run in London the southern half of the battle was not gamed; any action between the protagonist there was handled by the umpires/ control. This did lead throughout the course of the day to a stream of reinforcement coming up to help their Northern Comrades. It was up to the 5 man Army/Corps level of control to parcel out these to what they felt was the most deserving Kampfgruppe at the time…. As for Chris: he ended up as Chief of Staff for the British, something to do with dealing with supplies and replacements. Given the nature of the game it wasn’t possible to chat with him during the day. 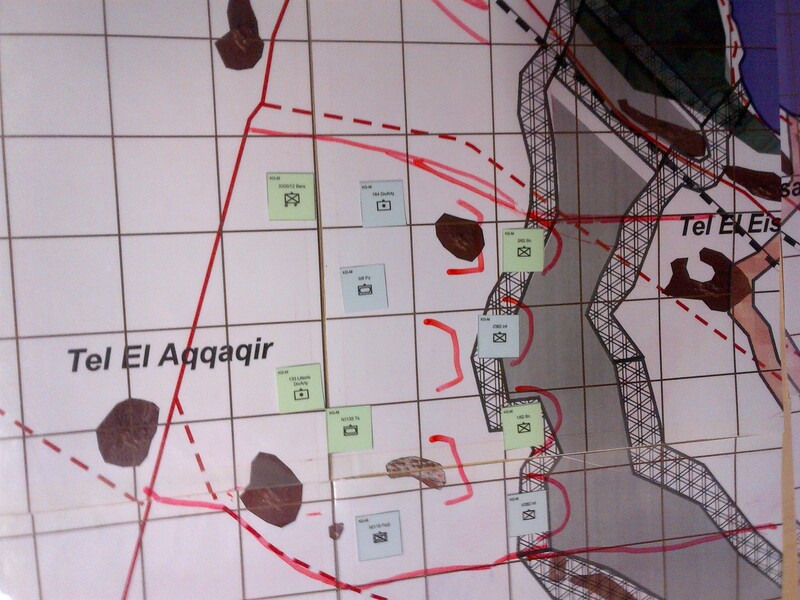 Our starting forces on the map, these positions were fixed and were not necessarily where we would have deployed. Note the neatness of the map annotations. The whole of the gamed area. The blanks bits are the other Kampfgruppes’ areas, boundaries are the long red lines. Here we have been hit hard by the British and pushed out of our front-line positions. We pushed as many of our reserve units in as we dared (Brian and Evan were keen to push more in but as the nominal overall Commander I overruled to try and husband what we had, not know what, if any, extra assets the higher HQ would give us.) 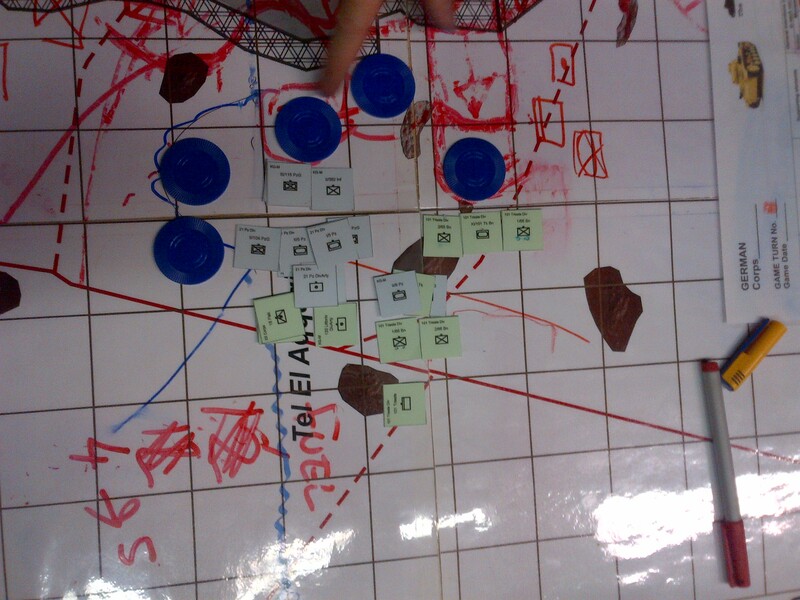 Fuel was an important consideration in the game for the Axis forces. I sneaked a photo of the higher HQ’s overall map, it was at their table whilst they handed over control of 21st Panzer to my area. I was original to use it to push the Allied forces back but this turned into an attempt to blunt the tip of their spears as they launched a major offensive that turned into a breakthrough. 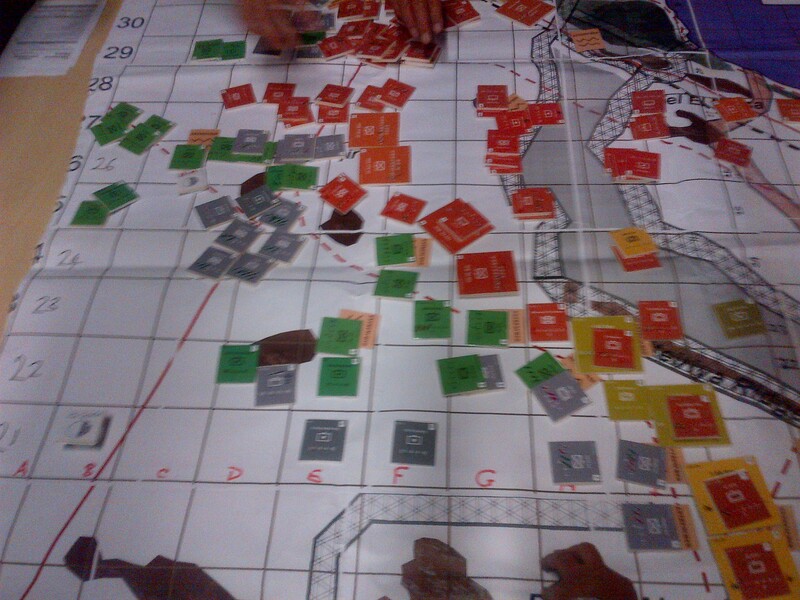 A blurry but hopefully informative shot of the control map at games end. 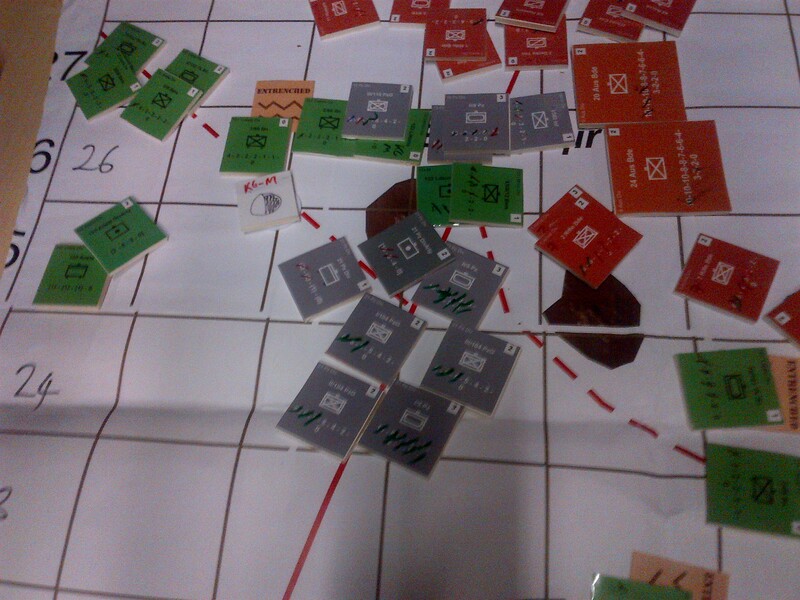 The sad end of 21st Panzer- reduced to 20% strength after only a few attacks…. 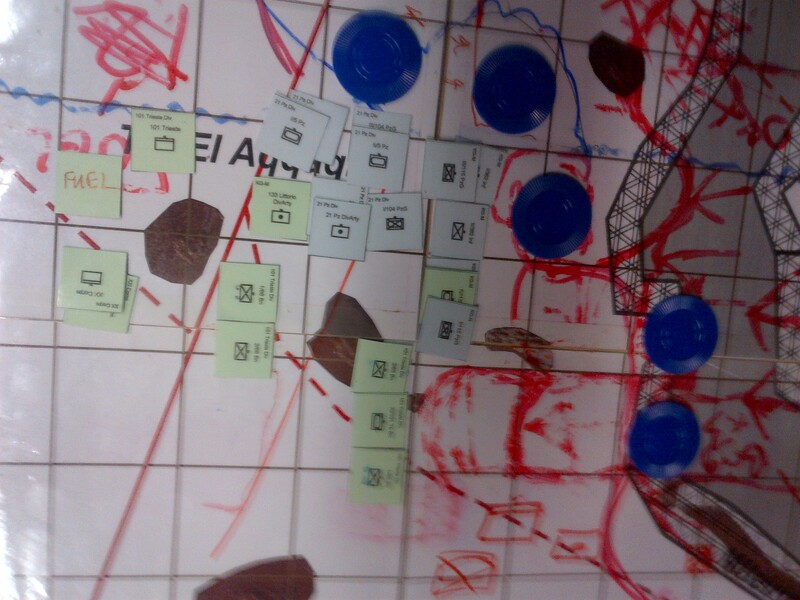 21st Panzer trying to blunt the Armoured Brigades tanks (represented by blue disks). Also by the end of the game our red pen annotations got increasingly frantic as we dealt with all the information coming in, often contradictory. The game went pretty much as expected really. The Germans were hit hard all along the line, then an overwhelming force smashed through in the north between the middle and Northern KGs, it was to this blunt this attack that 21st Panzer was sacrificed. The major success of the British was a small breakthrough in the south that was dealt with heavily by HQ at the time, fearing that it would be used a a jumping off point to split us from the Southern units off map. However in dealing with this it left us all a bit short when it was needed at the end of the game. It was interesting to see how well the Italians did, often holding the line by themselves, the typical wargamers’ jokes falling somewhat short when a mixed bag of Italians took a battalions worth of Australians POW. Ultimately we fought until we were spent and HQ had saved enough fuel of us to retreat with (I hear Tunisia is nice at this time of year). I always enjoy the format of the megagames, it’s really at a different level if like me you mainly play tabletop games with figures, in fact I try and get a few of the vague ideas across to other games I do for myself. I would be interested to know if the game was meant to be just a straight re-fight of the battle (with invariably the same result?) with our measure of success being able to hold out slightly longer than our real world counterparts 72 years ago, or whether there were enough tweaks to the forces to allow a radically different outcome to occur. 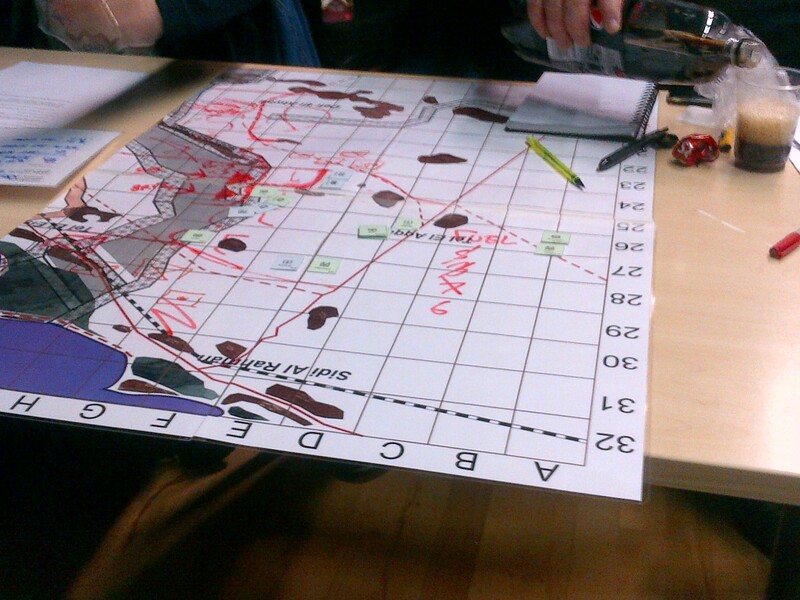 The Somme is lined up as the theme of the first Leeds based megagame next year and I can’t wait. Kits finished: 20. Pretty good, was on a bit of a roll with them. Books read: 28, not bad but can do better. The big question is can I have a Stakhanov- esque finish to the year in the final three months?